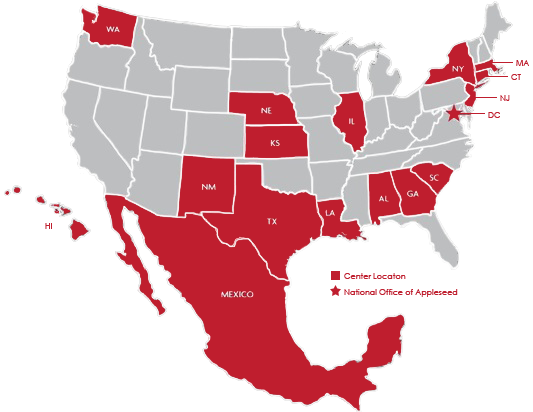 Massachusetts Appleseed is part of a non-profit network of 18 public interest justice centers in the United States and Mexico. The centers work both collectively and independently to build a society in which opportunities are genuine, access to the law is universal and equal, and government advances the public interest. The idea for what is now the Appleseed Network began in 1993 when members of Harvard Law School Class of 1958 voted to establish Appleseed. Its founders sought to develop a new approach to pro bono legal organizations, one that focused on broad systemic social initiatives rather than on the traditional provision of legal services to individuals. This vision grew out of the idea that the best way to achieve big results is to work for the kind of change that levels the playing field and transforms entire communities at a time. The Appleseed centers identify and address issues particular to their communities and then connect with private practice lawyers, corporate counsel, law schools, civic leaders, and other professionals to tackle these difficult social problems at their root causes. The Appleseed Network is now one of the nation’s largest legal pro-bono networks. The Appleseed Network and the Massachusetts Appleseed Center were both incorporated on the same day in 1994. Deb Silva served as the Director of the Equal Justice Coalition from 2012-2016, within the Massachusetts Legal Assistance Corporation. Equal Justice Coalition’s mission is to ensure civil legal assistance for low-income people in Massachusetts. Previously she served as the Director of Public Policy for AIDS Action Committee, Legislative Director for the Mass. Law Reform Institute, and Legislative Aide to former state Rep. Carl Sciortino. Prior to that she had her own private law practice. She holds a law degree from Boston College. She lives in Arlington with her wife and two children. When she’s not chauffeuring her children to their various activities, she enjoys gardening, photography, and hanging out with her three dogs. If you have any questions about what we’re doing and where we’re going, or if you’d like to schedule a one-on-one meeting to discuss further support, email Deborah at deb@massappleseed.org. 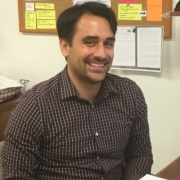 Jake’s professional and academic experiences have included researching and analyzing public policy, coordinating direct services for at-risk populations, and promoting systematic change through state and local advocacy activities. A Fulbright Scholar, Jake has a Master in Global Policy Studies from the LBJ School of Public Affairs at the University of Texas at Austin. Previously he worked as a Legal Services Coordinator for Human Rights First in Houston where he helped connect indigent asylum-seekers with pro bono attorneys. Jake lives in Brighton where he enjoys running around the Chestnut Hill Reservoir and eating excessive amounts of Mediterranean food. If you have any questions about our projects and policy recommendations, or if you think your organization could be a natural partner to MA Appleseed, email Jake at jake@massappleseed.org. Madeline is a recent graduate with a background in fundraising and writing. She spent her college years volunteering and interning at several nonprofits in the Greater Boston area with a primary focus on housing insecurity and education. Madeline is originally from New Jersey and joined Appleseed in February 2017. She enjoys biking and cooking, and has recently been trying to teach herself how to bake, unfortunately without much success. If you have any questions about donating, upcoming events, or anything we post on social media, email Madeline at madeline@massappleseed.org. Claude G. Lancome, Past Chair, Coast and Harbor Associates, Inc.
Robert S. Steinberg, Kronos Corp. The Board of Directors is composed of members from law firms in Massachusetts, as well as members from the financial community and other service industries. Its members represent the private, public, and academic sectors. In addition to the Board of Directors, Massachusetts Appleseed receives advice and counsel from an esteemed Board of Advisors. Many board members not only have served for several years on the Massachusetts Appleseed’s Board of Directors, but also have experience serving on advisory boards for other organizations and are also actively and personally involved in Center projects and fundraisers. Massachusetts Appleseed thanks the following supporters for their generous contributions. 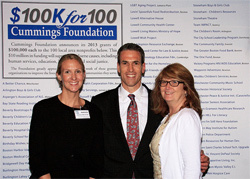 MA Appleseed receives “100K for 100” Cummings Foundation Grant Massachusetts Appleseed Center for Law and Justice was awarded a grant of $100,000 from the Cummings Foundation. This grant will support the Center’s project Keep Kids in Class: Breaking the School to Prison Pipeline. Our signature project positions Massachusetts Appleseed at the forefront of understanding the intersection of school discipline practices, zero tolerance, and youth entering the juvenile justice system. We seek to mitigate effects of zero tolerance, remove barriers to access to public education, and support at-risk youth to literally keep kids in class where they are safe, supported, and available for learning. Massachusetts Appleseed is an equal opportunity employer. We encourage applications from women, people of color and individuals from diverse backgrounds. Massachusetts Appleseed does not discriminate on the basis of race, color, national origin, ethnic background, religion, gender, sexual orientation, age, or disability.